Shop Epiphone Explorer Bass Hardshell Case from AMS with 0% Interest Payment Plans and Free Shipping. 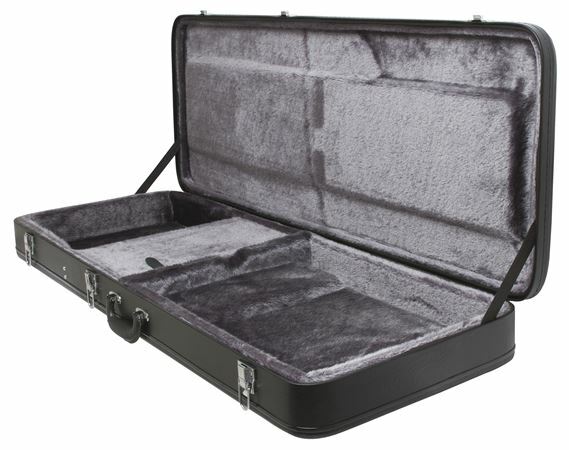 Epiphone Explorer bass case is designed specifically to fit your Explorer bass guitar to provide years of protection. Built to handle the rigors of the road but created with a plush interior to baby your bass guitar. This case will get the job done, but, the Epiphone Korina Explorer Bass does not drop right in. The interior of the case has to be modified to allow the guitar to fit. I bought this Epiphone case for my 1983 Gibson Explorer bass. The original case is literally falling apart. An original case replacement is very hard to find: very expensive and used when it can be found. I was hoping this Epi case would solve my problem, and overall it did. The bass fits in it nicely and snug as it should. The case has a narrower profile than the original, which I like, but the result: the headstock lays lower than in the original case. This means I need to turn the D and G tuning keys sideways or the headstock area of the bass is actually slightly supported by the tuning keys....they will at least touch the bottom of the case unless turned sideways, which makes some retuning necessary when taking the bass out to play it. Not a big deal. I put a little pad under the neck at the support, which raises the head stock a bit, but then the case doesn't close as easily, and may strain the hinges and closures. A small pad of just the right size should work fine to help the issue, but the G tuning key will have to be turned regardless. The original case is definitely deeper. If the D and G keys are turned, it is a perfect fit. Bought it for a DIY explorer 5 string bass. Plenty of room. hardware is a little cheap. This product is great, bass fits like a glove (like it should) and is well protected. Case still has room for things like a strap, extra strings, etc. Very reasonably priced as well. Perfect fit for the Korina Explorer bass. Very plush and tight fitting, nice big storage compartment.